Cystic acne appears similar to a nodule, but is pus-filled and routinely has a diameter of 5mm or more. Cysts originate deeper in the skin than typical pimples. These inflammatory lesions can be painful and commonly produce scarring. Contrary to a common belief, squeezing an acne cyst can cause an even deeper infection and more painful inflammation spreading under the surface of the skin which can last much longer and lead to the development of additional cysts. When most people think of acne, those little red dots on the surface of the skin come to mind, and the most practiced solution for dealing with them is to zap those suckers dry until they disappear completely. Polycystic Ovary Syndrome (PCOS) and acne. Is there anything I can do? It is not completely understood why or how the changes in the hormone levels occur in woman with Polycystic ovary syndrome (PCOS). This form of acne is the most advanced form of acne and will not go away on its own. In order to treat cystic acne, you must either take preventative measures and take action with a treatment that will work to treat this form of hormonal acne at it’s source. AcnEase is the ultimate herbal remedy for cystic acne that achieves sustained effects without the use of drying and irritating external ointments or serious side effects of Accutane or other oral products and is considered safe for use in adults and adolescents. AcnEase has been demonstrated to be effective in treating women with cystic acne. The results are often dramatic, owing to the severe nature of cystic acne. Within 1 month of treatment with 12 tablets/day, greater than 90% of women experienced a dramatic improvement in their skin condition. AcnEase works by restoring the internal balance that is disrupted by endocrine changes, mental tension, stress and diet. Acne is viewed as an external manifestation of an internal disorder. 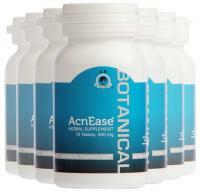 AcnEase is a unique natural acne remedy in that it addresses the cause of Acne and skin related problems. This all-natural herbal acne treatment does not simply treat the external symptoms of the disease but focuses on removing the underlying causes of skin problems. Finally, due the fact that AcnEase prevents the new acne it allows skin to regenerate preventing scarring. Accutane is used by many dermatologists due to the severe nature of the acne. The teratogenic effects of accutane restrict its use in women of child bearing potential. Therefore, it is crucial that women of childbearing age are not pregnant and do not get pregnant while taking Accutane. Women must use an appropriate birth control method for 1 month before therapy begins, during the entire course of therapy, and for 1 full month after therapy stops. Women should talk to their doctor about when it is safe to get pregnant after therapy with Accutane has stopped. This is problematic since many women develop cystic acne in response to hormonal fluctuations. Also, Accutane is noted to have a depressive effect on young males and today a release form is requested from those who intend to use it. AcnEase has also been effective in individuals with cystic acne that used Accutane and failed to respond or elected to terminate treatment due to side effects.